Nose: There's immediately sherry on the nose, mixed with ripe red apples, rum-soaked dark fruits, dates and raisins. Then notes of tobacco leaves and cedar wood emerge, accompanied by a touch of vanilla, coconut flavours and dark chocolate in the back. The alcohol tickles slightly in the nose. Palate: Voluminous and sweet start on the palate with Demerara sugar and dark fruits. Then warming notes of black pepper, cardamom, cedar wood and oak arrive, followed by nutty flavours, cinnamon and vanilla. Tender notes of cherry and sticky dark fruit linger towards the finish. Finish: The finish shows medium length with a warming mix of sweetness and spice. Dry notes of cocoa, tobacco leaves and cedar wood with a touch of creamy fruitiness on the tail. With water: Becomes very aromatic with significant flavours of coconut and vanilla when a few drops of water are added. Notes of dark fruit and tobacco leaves, however, are decreased. Wow, this is fairly spicy on the palate with cracked black pepper, even chilli! Very dry with almost no signs of fruitiness. The finish is dry, too, with slightly bitter notes of tobacco and cedar wood. Comments: A good single grain whisky with almost exotic fruit aromas and an interesting note of cedar wood. The paIate, however, can't really deliver what the noses promises, as I missed the expected sherry sweetness a bit. With water the whisky becomes very dry and extremely spicy! There one should deal sparingly with. 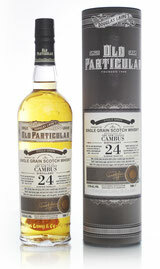 Nevertheless, this single grain whisky aged 25 years shows great potential. Nose: Sweet and fruity start on the nose with barley sugar, honey and orchard fruits. Then vanilla and butterscotch arrive, followed by a spicy touch of oak and white pepper. Notes of dark chocolate linger with a touch of herbal notes in the background. Palate: Sweet on the palate with vanilla, Demerara sugar and toffee. Slightly warming with white pepper and oak. Then notes of honey, apples and lemons emerge, nicely mixed with herbal lemonade and subtle milk chocolate towards the finish. Finish: The finish is long, warm, and deliciously sweet with brown sugar and toffee. Subtle spicy and slightly dry with oak and dark chocolate on the tail. With water: A few drops of water slightly tame the delicate sweetness while more herbal notes and lemonade come to the fore. Lots of sweetness on the palate with vanilla, toffee and barley sugar. Delicate orchard fruits mixed with herbal lemonade and only a hint of warming spices. The finish shows medium-length and becomes drier on the tail with oak and cocoa. 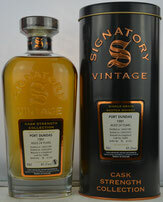 Comments: A beautiful, fruity single grain whisky from the closed distillery Carsebridge. Perfectly balanced with delicate fruits, delicious sweetness and slightly warming spices. Poised and elegant. Such a long ageing hasn't made the oak wood too dominating. On the contrary, the interesting notes of herbal lemonade provide freshness and liveliness. Best to enjoy neat. Nose: Sweet and spicy at first with vanilla and acacia honey. Hints of mushrooms - like taking a walk in the woods on an autumnal morning. Then oranges (not the juicy but more the overripe ones) and milk chocolate arrive, followed by toffee and spices - mainly oak and ginger. With time, notes of leather and tobacco (cigar box) emerge in the back. Palate: Wow - I wasn't expecting this intensity. Big, intense and rich. A lovely mix of spicy sweetness - acacia honey, cinnamon, caramel, vanilla and spiced oak. A big mouthfeel! Slightly bitter orange peel, tobacco notes and leather towards the finish. Very tasty! Finish: The finish is long, slightly warm, sweet and pleasantly spicy. Becomes drier towards the finish with fairly amounts of oak, leather, tobacco and cloves. With water: Fresh on the nose with a few drops of water. Sweet toffee and vanilla with a tamed spiciness of acacia honey and oak. The lovely sweetness is significantly decreased on the palate together with a tamed spiciness. However, the single grain becomes fairly dry with oak, cloves and notes of cough syrup. The finish is still long and less warming with only a hint of creamy and sweet vanilla, followed by very dry notes of oak, cedarwood and cloves. Comments: This single grain whisky has spent unbelievable 55 years in a single cask. 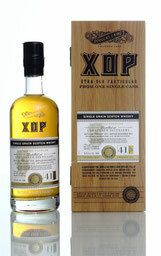 A superb and high quality dram, not (too) overpowered by the wood (if no water is added!). A lot is going on here and the grain needs a fairly amount of time to develop its full aroma. Lovely nose and complex palate with a long and woody finish. Another brilliant example how great grain whisky can be. Nose: Rich and sweet with vanilla, toffee and blossom honey. Fruity notes of yellow cherries and apricots emerge, followed by some citric fruits and oak spice in the background. Palate: As the nose suggests quite sweet with honey, vanilla and cherries plus an extra creaminess. Pleasantly warming with cinnamon, subtle white pepper and a touch of marzipan. Sticky notes of ripe plum arrive, followed by some bitter grape peel and cloves towards the finish. Finish: The finish is medium long, soft and creamy with blossom honey, vanilla custard, caramel and toffee. Slightly bitter grape peel, dry oak and cloves on the tail. Pleasantly warming. 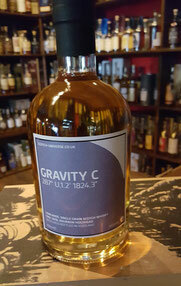 Comments: This single grain whisky from the independent bottler The Whisky Chamber is on the sweet side with a lovely vanilla nose that pleasantly echos on the palate as well as a good mastered alcohol. Good balance of fruit, oak and spice with not an unpleasant bitter note of grape peel in the background. Lovely sweet, creamy and deliciously tasty. Nose: The nose starts off with gentle caramel, vanilla and a fresh hint of lemon zest. With time dried fruit - gooseberry and strawberry - arrives, nicely mixed with background oak, acacia honey and a herbal touch of pine needles. Palate: Sweet and creamy on the palate with lots of vanilla and toffee. This is followed by dried fruits, more darker ones than those on the nose, and a touch of milk chocolate. Slightly warming with oak spice, pepper, and subtle nutmeg. Stimulates salivation with spicy notes of acacia honey and hints of pine needles towards the finish. Finish: The finish is medium long and rich. Lovely warming with some additional dried fruits - oranges and lemon, followed by sweet biscuits. Slightly spiced oak with a pleasant hint of acacia honey on the tail. With water: There's almost no change on the nose with a splash of water. Slightly spicy notes are added to the pleasant fruity and vanilla sweetness. On the palate, however, water enhances the spiciness getting fizzy and tickling on the tongue while the sweetness of creamy vanilla and the fruity elements are still present. The finish is short with an increased astringency of oak. Comments: This is quite an impressive example that single grain whisky doesn't need to be very old before being savoured. 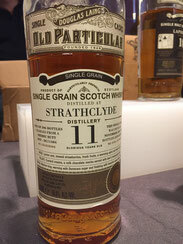 This just 11 years old Strathclyde is definitely on the sweet side with lovely layers of vanilla, toffee, and dried fruits, balanced with oak, spice and pleasant notes of pine needles. Good balance and good character - a delicate and rich whisky. No need to add water to this one. I thank Jan Beckers from Douglas Laing for the sample! Nose: Fruity start on the nose with yellow apples, pineapple and a hint of banana, lovely mixed with vanilla and biscuit. A tad of glue's shining through, followed by darker fruits, blood oranges and red cherries in particular. Earthy notes, damp wood and a touch of leather in the background. Palate: Big and spicy. Cracked black pepper, mixed with oak chips and caramelised ginger. Quite warming and subtle dry! Dried dark fruit with sweet vanilla and cereals, hints of wipped cream and a squeeze of grapefruit towards the finish. Finish: The finish is long, warm and spicy with cinnamon and cloves. Slightly sweet with vanilla and a nice Christmas-y touch of German lebkuchen. With water: A few drops of water significantly increase the delicate vanilla sweetness, while the fruity notes and earthy flavours are tamed. Sweet on the palate with lots of vanilla, apples and orange blossom. Less spicy and only slightly warming with dry notes of oak towards the finish. The finish shows medium length, some oak spice with very dry notes on the tail. 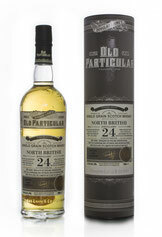 Comments: A wonderful and very enjoyable single grain whisky from this closed distillery. Bold and spicy with a lovely earthy touch on the one hand - sweet and fruity with cheering up on cake aromas on the other. Very appealing. Such a long ageing hasn't made the bourbon wood too dominating. Very well balanced with length and complexity. No water needed. A well-matured grain! Nose: The nose starts off with lingering notes of vanilla, biscuit and icing sugar. Blossom honey and caramel arrive, followed by yellow fruits, mainly apricots, gently dripped with rum, and a fresh whiff of lemons in the back. Palate: Deliciously sweet on the palate with vanilla, icing sugar and tropical fruits - apricots and mango. Nicely warming with spiced oak, white pepper and a slightly bitter touch of orange peel towards the finish. Finish: The finish is long, fruity, creamy and warming with apricots, acacia honey, white pepper, and oak spice. With water: On the nose, water brings more vanilla, icing sugar and biscuit flavours to the fore while the fruitiness is tamed. Loads of sweet vanilla on the palate with apriots, pears, and notes of popcorn. Less warming with a tamed spiciness and no bitter notes towards the finish. The finish is medium long, creamy, soft and nicely sweet with biscuit, vanilla, apricots and blossom honey. Comments: A lovely, middle aged single grain whisky. Although pale in colour, it has well benefited from the casks. Full of vanilla sweetness, richness and depth without any alcohol harshness. Reminds me of liquid "Vanillekipferl", this tiny crescent-shaped biscuit made with almonds and dusted with icing sugar. Best to enjoy with a splash of water. Nose: The nose starts off with vanilla, caramel and dark fruits, mainly plums. Delicate notes of baked apples arrive, mixed with cinnamon spice and orange oil. Oak and some earthy flavours in the back. Palate: A sweet start on the palate with orange and caramel, accompanied by an intense spiciness of black pepper, oak, cloves and cinnamon. Once the spiciness fades, notes of dark berries and acacia honey linger towards the finish. Finish: The finish shows medium length with sweet vanilla, dry oak, cloves and a hint of earthy flavours on the tail. With water: Fresher on the nose after adding a few drops of water. There's more vanilla coming through, mixed with dark berries, plums and subtle oak. The bold spiciness is significantly tamed while notes or oranges, caramel and oak dominate. Less sweet. The finish is medium long and slightly warming with a lovely spicy mix of oak, cloves, cinnamon and acacia honey. 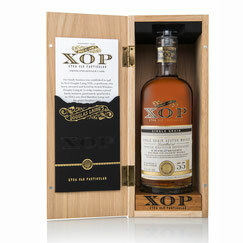 Comments: This single grain whisky has been matured in an oak cask for an impressive period of half a century! The final result is an enticing oldie, well matured with a lovely balance of oaky spiciness and bourbon derived flavours. Rich, fruity, spicy, and an excellent mouthfeel. A cracking example of a mature grain! Nose: Delicate notes of vanilla and sweet toffee nicely linger with yellow plum and butterscotch on the nose. Fresh and lively with citric fruits and a soft touch of oak and cedarwood in the back. Palate: Deliciously sweet on the palate with vanilla, caramel and cereal notes, followed by a lovely touch of citric fruits - tangerine and lemon. This is accompanied by a warm mix of delicate spices - oak, pepper, caramelised ginger, and cedarwood. Very tasty! Finish: The finish is long, slightly warm and sweet with brown sugar and subtle spicy acacia honey. A bit of drying notes of oak and cedarwood, with a hint of cough syrup on the tail. With water: Fresh and clean on the nose with a few drops of water. Sweet toffee, followed by a touch of citric fruits. But less presence of vanilla and oak spice. There's significantly more spice coming through on the palate while the delicate vanilla and toffee sweetness is almost tamed. Very warm with pepper, oak, nutmeg, cloves and allspice. The finish shows only a hint of creamy sweetness, followed by very dry notes of oak, cedarwood and a fairly bitter touch of cough syrup. Comments: This is a superb and high quality dram. Half a century old but not at all on the woody side. Not entirely complex but very elegant. A brilliant example how great grain whisky can be. No water please! Nose: Sweet start on the nose with lots of vanilla, biscuits and toffee. The alcohol is very present but not pungent. Subtle notes of spiced oak, cinnamon and cloves in the back. Palate: Wow - much sweeter than the nose suggests. Custard, icing sugar and apples. Sweet oranges at first but turn into slighty bitter ones with time. This is complemented by a warming mix of alcohol and spices - oak, black pepper, nutmeg and cloves. Quite oily on the tongue with lovely toffee notes towards the finish. Finish: The finish is long, warm and creamy with delicate red apples coming through. Slightly bitter oak, orange peel and cloves on the tail. With water: Water tames both the alcoholic bite and the vanilla sweetness bringing more bitter orange peel and slightly perfume-like notes to the fore. The vanilla sweetness, however, continues on the palate nicely combined with toffee, oranges and red apples. Slightly warm with significantly tamed spices. The finish is a bit shorter, subtle warm but still spicy, with lovely notes of red apples and oranges on the tail. Comments: Behind the alcoholic curtain, this single grain whisky shows a lovely vanilla and toffee sweetness. Reasonably complex and packed with delicate notes of oranges and red apples, especially when diluted. Quite drinkable neat but opens up very nicely with a few drops of water. A rich and rare independent bottling from the closed Port Dundas distillery. I thank Kirsch Whisky Import for the sample and the photograph (displays a previous bottling)! Nose: Sweet and fruity on the nose with vanilla, brown sugar, melons and apricots. Cereal notes with a pleasant hint of spice - cinnamon, cloves, and a touch of oak in the back. Palate: Much sweeter than on the nose with vanilla, toffee, apricots and gentle tangerine. This is followed by a warming spiciness of cinnamon, oak, subtle black pepper and clove. A touch of dry cocoa lingers towards the finish. Finish: The finish is medium long and sweet with vanilla custard, caramel and Demerara sugar. Slightly bitter orange peel and cloves on the tail. Pleasantly warming! With water: On the nose, loads of vanilla are coming through by adding a few drops of water. Very sweet and soft! Water tames a bit of the spiciness on the palate bringing more vanilla and toffee notes to the fore. The finish is significantly shorter with sweet vanilla and Demerara sugar. Slightly warming with crisp oak on the tail. 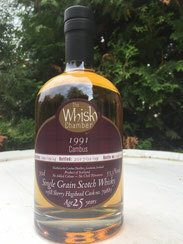 Comments: This single grain whisky from the now closed Cambus distillery in the Lowlands is on the sweet side with a lovely vanilla nose that pleasantly echos on the palate. Rich and tasty with a good mastered alcohol. Nice balance of fruit, oak and spice. Not the most complex grain whisky on the planet, but deliciously sweet, soft, creamy and, at least to me, very savoury and easy to drink! Nose: The nose starts off with light yellow fruit - apricots and subtle carambola. Sweet vanilla and toffee emerge, mixed with sugared almonds, acacia honey, and gentle banana bread with soft grain notes. Substantial and attractive. Palate: Sweet, creamy and soft on the palate with lots of vanilla and toffee. Sherbety with yellow fruit and a slightly warming spiciness of oak, pepper, ginger and subtle nutmeg. Stimulates salivation with silky notes of honey towards the finish. Finish: The finish is long and rich. Sweet notes of vanilla, toffee and acacia honey pleasantly linger with sticky yellow fruit jam and slightly spiced oak on the tail. With water: There's almost no change on the nose with a splash of water. Slightly meaty notes are added to the pleasant sweetness. Water enhances a bit of the oaky spiciness getting fizzy and tickling on the tongue while the creamy sweetness and fruity elements are still present. Quickly fading on the finish with a light astringency. Comments: This single grain whisky is definitely on the sweet side with a well mastered alcohol. Good balance and good character. A bit uni-dimensional though. It might lack the layering you want from a 24 year old. I wonder what this would be like with another few more years of maturation. Nonetheless, a delicate and rich whisky. Nose: Sensual and flavourful on the nose! Delicate toffee, lingering vanilla and subtle coconut flavours deliciously mingle with soft ripe apricots, peaches and tangerine. Candy sweetness is nicely complemented by a smooth spicy touch of oak, cloves and cedarwood. Palate: Soft and creamy on the palate with vanilla sweetness, toffee, butterscotch and a pleasant fruitiness of dried apricots, apple skins and subtle citric notes. A warming and slightly hot spiciness arrives with pepper, ginger, subtle cloves and sandalwood. Tender coconut flavours nicely linger with caramel towards the finish. Finish: The finish is medium long, warm and deliciously sweet with toffee and a mild spiciness of oak, cedarwood and cinnamon on the tail. With water: A few drops of water significantly decrease the delicate sweetness of this grain whisky, bringing more citric flavours to the fore. Very creamy on the palae with vanilla, toffee, subtle coconut and a mix of sligthly warming spices. The finish is medium long, sherbety, with vanilla, cinnamon and prickling oak on the tail. Comments: A wonderful single grain whisky from a forgotten distillery closed in summer 1986. Smooth, creamy and very appealing. Although 41 years of age, the influence of the wood is obvious but the oak isn't overpowering at all. The spirit has extracted delicate toffee, vanilla and coconut flavours over time and is in perfect balance with subtle flavours of sandalwood and cedarwood coming from the oak. Don't add water! A brilliant whisky experience - I very much enjoyed this beauty! Nose: The nose starts off with loads of vanilla - custard and ice cream, complemented by lingering coconut and white chocolate. A touch of citrus emerges with a whiff of oak and gentle spice behind. Rather complex and very delicate. Palate: Very smooth at the beginning with lots of lingering vanilla and a slight citric note. This is followed by a significant amount of oak, subtle cinnamon and German Lebkuchen spice. Very warm indeed with delicate roasted nuts, dark honey and prickling oak towards the finish. Pleasant and vibrant. Finish: Long and deliciously sweet with vanilla and some dark fruit, maybe plum. Gets a bit dry on the tail with oak, ginger spice, and black pepper. Vibrant and mouth-coating. With water: The delicate vanilla flavour significantly decreases on the nose with a slightly bitter touch of citrus and oak spice coming through. Water tames the warm spiciness on the tongue bringing a creamy sweetness of delicate vanilla and coconut with winterly spice to the fore. The finish is medium long and warm with prickling oak and a warm touch of pepper on the tongue. Comments: An appetising single grain whisky, with good length and complexity. Well matured and well selected. The delicate vanilla note on the nose does pleasantly echo on the palate, with a good balance of oak and spice. A savoury experience, especially when giving the grain whisky some time to develop its full aroma. Well done!